When you join an organisation, you normally get a computer before you get your desk keys. Traditionally, it was a desktop, but in today’s take-your-work-home world, where companies are realising they can get more work out of their employees with such ‘perks,’ laptops are becoming de rigeur. The falling prices of laptops have, no doubt, also made this decision easier. The break-out period for laptops was the last quarter of 2007: While PC sales grew by 10.9 percent, laptops grew by a whopping 85 percent. The same period in 2008 coincided with the beginning of the slowdown. With companies not hiring, PC sales fell by 10 percent. Laptop sales did continue to grow, but at a relatively slower 31 percent. While employers weren’t hiring, employees were utilising the time off to study more, for which they required laptops. Last year, through recession, sales were flat. But the last quarter of 2009 has been boom time. 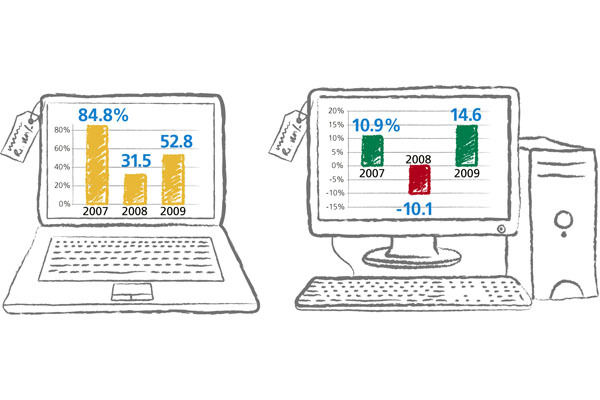 PC sales grew 14.6 percent, and laptops recovered, up at 53 percent. The PC market is busy this season, with sales of laptops, desktops and netbooks soaring 25.7 percent. Looks like company increments are working their magic.